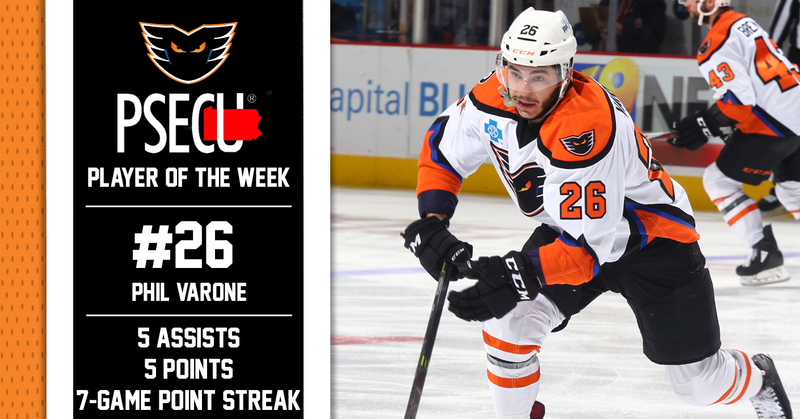 Lehigh Valley, Pa. — With five points (5A) this weekend, a plus-four rating and an on going seven-game point streak, Lehigh Valley Phantoms forward Phil Varone has been named the PSECU Player of the Week for the first time this season. The Phantoms, currently in the midst of their longest road swing of the season, traveled to Connecticut on Wednesday night for a game against the Hartford Wolf Pack. Lehigh Valley exploded for seven goals en route to a 7-3 win over Hartford, which included a two-goal performance from Chris Conner. Varone got his week started early when he dished a centering feed from the corner to linemate Greg Carey, who promptly deposited it into the back of the net past former Phantoms’ goaltender Dustin Tokarski to make it 1-0 just 1:05 into the first period. Varone finished the night with a plus-two rating and three shots on net. On Saturday, the Phantoms faced their first North Division opponent of the season when they took on the Binghamton Devils in the Southern Tier of New York. Varone found the scoresheet again early in the first period with an assist on Philippe Myers’ goal at the 6:55 mark. Then, with the Phantoms on a power play early in the second period, the reigning league MVP would drop an MVP-caliber pass onto the stick of T.J. Brennan who wristed a shot into the net for his 152nd career goal in the AHL. By game’s end, Varone had collected three helpers on goals from Philippe Myers, T.J. Brennan and Nic Aube-Kubel as well as another plus-two rating. Lehigh Valley traveled to Chocolatetown on Sunday for the first time during the 2018-19 season for a late-afternoon contest against the Hershey Bears. While the end result saw the Phantoms take their first road loss of the season, by a score of 3-1, Varone managed to collect another assist on Connor Bunnaman’s first professional goal midway through the second period. As of Monday, Varone is currently on a seven-game point streak stretching back to October 13, 2018. Over those seven games, the 27-year old has now amassed two goals and 10 assists for a total of 12 points and is tied for third in the league for longest pointstreaks during the 2018-19 season.